Searching for some for some sarcastic ironic quotes and sayings i.e. 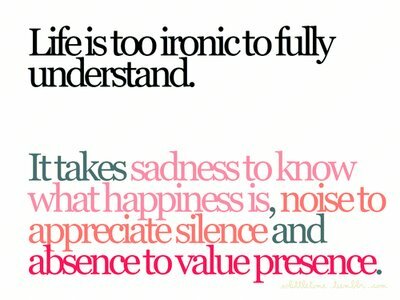 quotes which defines ironies in our life, love, relationships and everything we look at human level. If yes, now you don't need to search for them anymore. As here I have compiled downs some of the best ironic quotes on love, life, relationship and our human nature. Just hope you will like the quote compilation and able to find some meaningful quotes to say or write. He was one of the most supremely stupid men I have ever met. He taught me a great deal. Isn't it ironic that we ignore those who adore us, adore the ones who ignore us, hurt thos who love us, love the ones who hurt us. What cannot be said above all must not be silenced but written. Irony is Fate's most common figure of speech. Don’t underestimate the value of irony—it is extremely valuable. It is the oldest ironies that are still the most satisfying: man, when preparing for bloody war, will orate loudly and most eloquently in the name of peace. It was growing late, and though one might stand on the brink of a deep chasm of disaster, one was still obliged to dress for dinner. God hides the fires of hell within paradise. But that's men all over ... Poor dears, they can't help it. They haven't got logical minds. Give the People what they want - and they'll get what they deserve. Irony - The modern mode: either the devil’s mark or the snorkel of sanity. Eternal Dilemma, Too tired to stay up, yet too awake to fall asleep. When people see you lying down with your eyes closed they still ask: "Are you sleeping? ".